The work presented below is related to our companion paper in this issue, entitled: Substance P in solution: trans-to-cis configurational changes of penultimate prolines initiate non-enzymatic peptide bond cleavages. 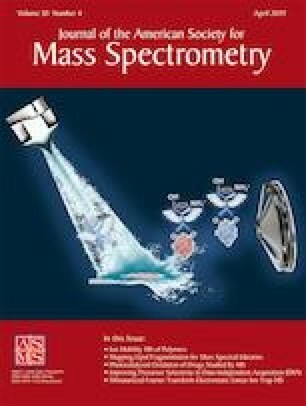 Two-dimensional ion mobility spectrometry (IMS-IMS) and mass spectrometry techniques are used to investigate structural transitions for [M+3H]3+ ions of substance P (subP) upon collisional activation (CA) in the gas phase. In this approach, different conformations of ions having a specified mobility are selected after an initial IMS separation, collisionally activated to produce new conformers, and these product structures are separated again using a second IMS region. In this way, it is possible to follow folding and unfolding transitions of different conformations. The analysis shows evidence for five conformations. Unlike other systems, every transition is irreversible. Studies as a function of activation voltage are used to discern pathways of structural changes prior to reaching the energy required for dissociation. Thresholds associated with the onsets of transitions are calibrated to obtain estimates of the energetic barriers between different structures and semi-quantitative potential energy diagrams are presented. Overall, barriers associated with structural transitions of [subP+3H]3+ in the absence of solvent are on the order of ~ 40 kJ mol−1, substantially lower than the ~ 90 kJ mol−1 required for some similar structural transitions in solutions of ethanol. Comparisons of the transition energies in the gas phase with thermochemistry for similar transitions in solution provide clues about why reverse transitions are prohibited. The online version of this article ( https://doi.org/10.1007/s13361-019-02160-3) contains supplementary material, which is available to authorized users. This work is supported in part by funds from the National Institute of Health, R01 GM117207-04, and the Indiana University Robert and Marjorie Mann fellowships (CRC, DRF). The work at TAMU (DHR) was funded by NSF (CHE-1707675) and NIH (P41GM121751-01A1).